When it comes to finding the best zombie games around, there’s no need to use your braaaaains, because we’ve done all the legwork for you. All jokes aside – well, some jokes aside – we know how difficult it can be to narrow down the now-enormous field of gaming into something you might actually want to play, especially if you’re just getting started, so we’ve rounded up a selection of the best zombie games from across all the most popular consoles. It might surprise you to learn that the best place to start might not always be with the latest, most heralded, most gorgeous-looking games to hit the shelves, because there are some certified golden oldies in our list. Harking back as far as 1996 (although admittedly with some facelifts here and there) no list of great zombie games would be complete without the likes of Resident Evil, the Walking Dead, or even Plants vs Zombies. There’s something for pretty much every platform under the sun – including, in one standout case, the kitchen table – but seeing as you’re most likely to be getting your hands on them for the latest consoles, we’ve linked you out to the most common PS4 or Xbox One versions for ease. However if Resident Evil 0, for example, is just the treasure you’re after for that GameCube gathering dust in the wardrobe, there’s nothing to stop you delving into those Amazon Sellers lists but your bank balance. Who knew pea shooters could be so effective? While it might not be the original zombie game (that accolade apparently goes to 1982’s Entombed for Atari 2600 – kids, if you don’t know what an Atari is, ask your parents) Plants vs Zombies is where it all started for a lot of us, and we think it’s still the best out there. Brilliantly simple but devilishly addictive, it’s a tower defence game that sees you protect your garden from a swarm of zombies through deploying a defence line of plants. That’s right, plants, and aggressive anthropomorphic ones at that. For the thrill of zed-killing action without the gore, this makes a great game for all ages. This much-anticipated sequel to the original hit is now a bit of an old-timer in the world of video games, having been released way back in 2009, yet it’s still unbeatable when you’re just in the mood for kicking back with some pals and wailing on zombies. The expertly realised combination of varied enemies, and the requirement for some real thought and teamwork rather than just button-mashing, made it something of a revelation. And besides, who doesn’t love a co-op? If its hordes of dedicated fans are to be believed, Naughty Dog’s The Last of Us isn’t just one of the best zombie video games out there, it’s one of the best games full stop. That might seem like a big claim, but reviewers have been uniformly blown away by the cinematic gameplay and harrowing storytelling since its release in 2013. If you’ve ever seen The Road, you’ll have some idea of how unrelentingly desperate the lives of The Last of Us’ characters are, and you’ll find yourself rooting for their survival even when they resort to some pretty dark measures. It helps immeasurably that the voice acting, sound design, and above all storyline are phenomenal, giving the whole thing a filmic edge that’s yet to be bettered. You might think you’ve had your fill of first-person shooters over the years, but this edition of Black Ops is a must for lovers of zombie games. Not only does it pack in three creative maps in the fan favourite Zombies mode, and an old-school arcade-style shooter in the form of Dead Ops Arcade 2, it adds a dangerous new flavour to campaign play too. That’s all thanks to the new-to-series Nightmares mode, which turns every enemy in the game’s main campaign into the undead. Chilling. 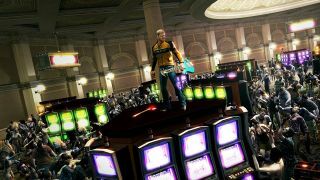 If you’ve played the original 360 breakout hit Dead Rising, you’ll recognise the same Paul Blart-esque japes and ad-hoc appeal in Dead Rising 2 that sees your hero pitted against hordes of the undead in an eerily deserted mall/casino/hotel. If you haven’t, you’re still in for a treat. Adding in just enough newness to keep it feeling fresh, the sequel builds on the success of the original with bumped-up mini-bosses, more focused player-on-zombie combat, and, on a practical level, more save slots and safe spots to save in – try saying that three times fast. Has there ever been a combination cooler than parkour and zombies? Wait, don’t answer just yet, because even if you just strained your eyes from rolling them so hard, we think we can change your mind. If you’re tired of the finger cramp-inducing button pressing and surge of adrenaline from unleashing the fury on endless streams of zombies, take this out for a whirl, because it requires pause for thought, and occasionally a good bout of head-scratching, to get to a meaningful conclusion on how to get out of sticky situations, making it decidedly more enriching than some other zombie-killing fare out there. A bit of a wildcard, we know, but board games have been growing in popularity in recent years, and deservedly so. This is one for game nights with the gang, with a storyline that sees you team up against the shuffling hordes to find weapons, gain XP, and most importantly, kill zombies. It doesn’t need a whole bunch of controllers or a big TV screen, just for everyone to remember the rules and follow them – the alternative? Certain death for your tiny little player and all their comrades. Play one of the included scenarios on one of ten maps, download extra from the dev website, or even create your own for the ultimate tailored survival horror experience. Since the original Resident Evil first defined the survival horror genre back in 1996, there have been more sequels and remasters than you can shake a joystick at, so it can be difficult to know where to dive in if you haven’t been following. We think the Origins Collection represents the best of the action from across Racoon City, with a package comprising prequel Resident Evil 0, and an HD remaster of the original Resident Evil that ups the creep factor, and the stakes, while still staying true to a classic. Relative newcomer Resident Evil 0 is no accidental inclusion either, and holds its own with suspenseful atmosphere-building and a unique “partner zapping” hand-off system that was a first for the series. While the original Walking Dead is an incredible game in itself, redefining what fans could expect from video game storytelling and giving us one of the most beloved characters in the zombieverse in the form of Clementine, this celebratory collection gives you way more zombie action for your buck. It encompasses seasons one through three, as well as a side story featuring fan favourite character Michonne, and even has something to offer fans who’ve already played their way through the series, with gorgeous enhanced graphics up to season three. All that, plus the developed characters, storyline and atmosphere fans have come to expect, makes it the perfect package for zombie game fans. Need a little break from the undead? See how many of our top 10 Xbox 360 games you've already played, and check out the ones you should be playing.